Pictured from left are APD Cmdr. Lindell Smith, Drug and Crime Coalition Director Bob Johnson, Sgt. John Beasley, Cmdr. Emilio Olivas, Cmdr. Guy Chavarria, Drug and Crime Coalition Manager Nancy Husselman, Sgt. Chris Boor and Chief Don Raley. 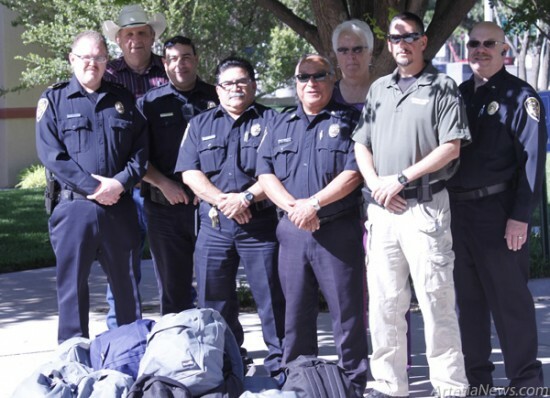 Artesia Police Department officers gathered at the Chamber of Commerce this morning to receive backpacks from the city’s Drug and Crime Coalition. The backpacks, filled with blankets, towels, food and toiletries, will be given by officers on patrol to the city’s impoverished, homeless and needy. Artesia’s homeless aren’t an epidemic, according to APD Cmdr. Lindell Smith, but the city will do what it can to help those in need. There won’t be a system in place to assure that no person is given more than one backpack, but that doesn’t bother the police department. “If we see that someone needs help, we’ll do the right thing and give to those who need it,” said Smith. … For the rest of the story, subscribe in print and on the web.